Welcome back for another installment of my series on some of the best Storming The Castle Movie Scenes. For those of you just joining this series, these are movies scenes which my hubby, brother and I have come up with. They are scenes in sci-fi, fantasy or comic book movies which depict someone (usually good guys) storming the enemy’s position in an epic way. This week, I want to tell you about a scene from the movie which started my love of science fiction. When I was about five or six years old, my dad bought a reel-to-reel projector to play home movies on. Then, he bought something that changed my brothers’ and my lives for the better and forever. Daddy brought home the reel to reel short version of the iconic movie, “Star Wars IV: A New Hope”. We drove our Dad nuts wanting to watch that movie all of the time. I am truly surprised that my mother doesn’t hate that movie now. Anyway, if you are a sci-fi fan of any degree, you have seen this movie. at least five times. 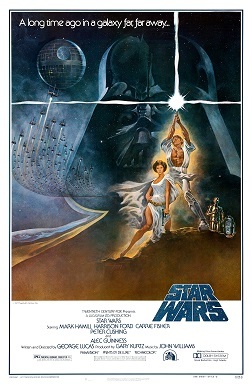 Thanks to George Lucas, life in other galaxies had come to our theaters and home. This man started something that caused the movie industry (and geeks) to sit up and take notice. This time-honored tale of good versus evil introduced us to some of the most iconic characters in movie history. Little did we know that Lucas was taking us on an unforgettable adventure that would span over 40 years (VII is on its way). As this is one of the most popular movies in the Geekdom, I know that I don’t have to give much of a preamble. All of you have already figured out which scene I am referring to. So grab some popcorn, relax and check out this scene of Luke Skywalker and Han Solo taking it to the Empire with two torpedoes down the hatch.